WE MAY never know who the Anzick child was. Why he died, just 3 years old, in the foothills of the American Rockies; why he was buried, 12,600 years ago, beneath a huge cache of sharpened flints; or why his kin left him with a bone tool that had been passed down the generations for 150 years. One thing, however, is certain: his afterlife is anything but ordinary. This week, geneticists announced that the boy is the earliest ancient American to have his entire genome sequenced. Incredibly, he turns out to be a direct ancestor of most tribes in Central and South America – and probably the US too – as well as a very close cousin of Canadian tribes. The find offers the first genetic evidence for what Native Americans have claimed all along: that they are directly descended from the first Americans. 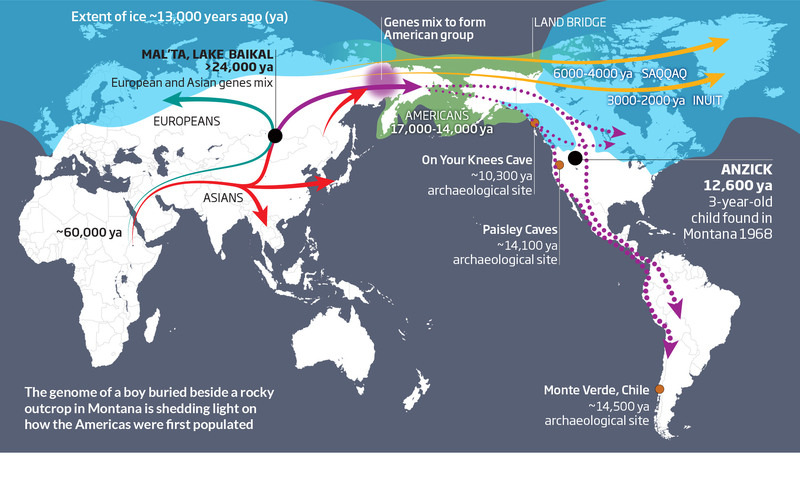 It also confirms that those first Americans can be traced back at least 24,000 years, to a group of early Asians and a group of Europeans who mated near Lake Baikal in what is now Siberia. And it dispels a controversial theory that the Americas were first populated by west Europeans who somehow crossed the Atlantic Ocean. The boy was discovered in Montana in 1968, when diggers working on land owned by the Anzick family accidentally ploughed into a huge cache of stone tools. The flints were typical of the Clovis period, a short archaeological period in North America lasting from 13,000 to 12,500 years ago. Beneath them lay a handful of bone artefacts and a skeleton. Clovis artefacts are scattered all over the western US. Archaeologists largely believe that the first Americans arrived by a land bridge from Asia about 15,000 years ago, and some went on to develop Clovis tools (see “A history of the first Americans in 9½ sites”). Willerslev and his colleagues were able to extract enough viable DNA from the boy’s badly preserved bones to sequence his entire genome. They then compared this with DNA samples from 143 modern non-African populations, including 52 South American, central American and Canadian tribes. The comparison revealed a map of ancestry. The Anzick child is most closely related to modern tribes in Central and South America, and is equally close to all of them – suggesting his family were common ancestors. To the north, Canadian tribes were very close cousins. DNA comparisons with Siberians, Asians and Europeans show that the further west populations are from Alaska, the less related they are to the boy. Fully sequenced genomes remain rare, so the bulk of the analysis was done by looking at genetic markers known as single nucleotide polymorphisms or SNPs. To confirm the pattern, Willerslev and his team sequenced full genomes from three contemporary Mayan and Karitiana individuals in Central and South America. The findings offer genetic confirmation that the first Americans crossed the land bridge that once stretched from Siberia to Alaska across the Bering Strait. Unfortunately, long-standing tensions between US tribes and scientists mean there is no significant genetic data available from these peoples (see Leader, “An ancient genome alone can’t heal long-standing rifts“). Having that data, says Reich, could help determine which groups lie on either side of the North and South American family tree. In November, Willerslev published the genome of another ancient boy, the 24,000-year-old Mal’ta boy, from the shores of Russia’s Lake Baikal. The boy’s DNA showed he descended from a mating between early Asians and proto-Europeans, and that he is related to modern South Americans. Like modern South American DNA, the Anzick DNA is a mix of Mal’ta and other Asian DNA, pointing to a “source” population for the first Americans, probably in far eastern Siberia (see map). In fact, Willerslev wagers that the first group to cross over from Siberia was no more than 100 strong. Another of Willerslev’s co-authors, David Meltzer of the Southern Methodist University in Dallas, Texas, is more cautious. For now, he says, we have just one genetic data point. And the study cannot address whether early migrants came through the interior of North America, or hugged the coast. The interior route would not have opened until 13,500 years ago, but earlier remains have been found in Monte Verde in Chile. So a first group may have come down the coast, and later groups from the same source population followed inland, carrying the same genetic heritage. Perhaps the most evocative mystery that remains is the identity of the boy himself. His is the only known Clovis grave. The tools he was buried with – including one that was already 150 years old and fashioned from an elk bone – would have been priceless heirlooms to those who carried them. Yet they left them in the ground with a child. We may never know who the Anzick child was, but scientists and local US tribes have agreed to lay him back to rest (see “Tribal healing: Anzick child genome changed my life“). He will be reburied sometime in the next few months.